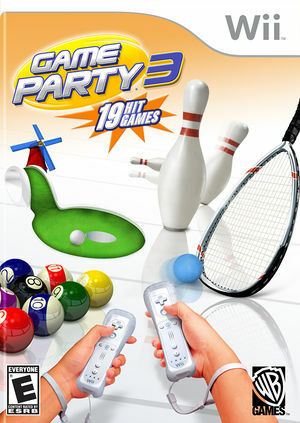 Game Party 3 throws another can't-miss bash with this collection of 19 favorite games. The eight new games include Mini-Golf, Bocce, Croquet, Racquetball, Pool, Bumper Pool, Smack-a-Troll, and a remake of arcade classic Rootbeer Tapper. Returning Game Party events include Darts, Shuffleboard, Beanbags, Horseshoes, Trivia, Skill Ball, Hoop Shoot, Ping Cup, Puck Bowling, QB Challenge, and Lawn Darts. Each of the 11 returning games has been updated with new layouts and new levels. Round up four friends for multiplayer fun or set bracketed tournaments for 16 players. Customize your character, play righty or lefty, track your high scores, and earn game tickets to unlock special items and skills. The graph below charts the compatibility with Game Party 3 since Dolphin's 2.0 release, listing revisions only where a compatibility change occurred. This page was last edited on 11 January 2018, at 11:36.